By no means all galaxies are spiral in shape. This illustration - of NGC 5253 in Centaurus - shows another less common galactic form, the irregular galaxy. Vast accumulations of stellar material, typically containing several million individual stars. They range in appearance from the irregular, through the elliptical, to delicate and elaborate spirals. Galaxies come in all shapes and sizes. The largest Local galaxy is M31, the Andromeda Galaxy, which is about 200,000 light years across, a diameter twice that of our own Milky Way Galaxy. 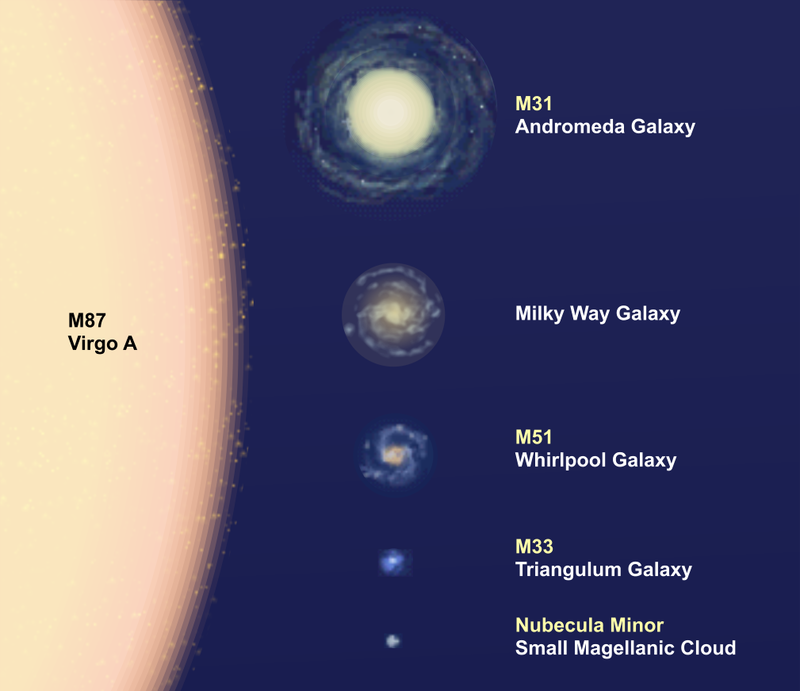 Far, far more massive than any member of the Local Cluster, though, is Virgo A or M87, a giant Elliptical Galaxy at the heart of the Virgo Cluster. A typical spiral galaxy, adrift in a still and starless void. A galaxy like this, fairly similar to our own Milky Way Galaxy, can easily be several hundred thousand light years across, and carry thousands of millions of stars.